Most of the time when people think about noodles or pasta, Italian cuisine comes to mind. But the reality is that in Asian cuisine, noodles come in a huge variety of forms and flavors. Up in N. Raleigh you’ll find the new Zanyu Asian Noodles which pays homage to this humble creation. 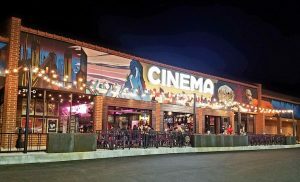 Opened in November of 2017, Chef Michael Bongiorno had spent many years in S.E. Asia running kitchens for major hotels before settling down in Raleigh. And Zanyu Asian Noodles is designed to bring some of that great food he experienced while living abroad. 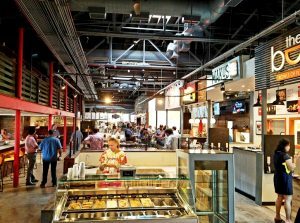 I think you will be very pleasantly surprised by the taste and authenticity of the delicious eats here! 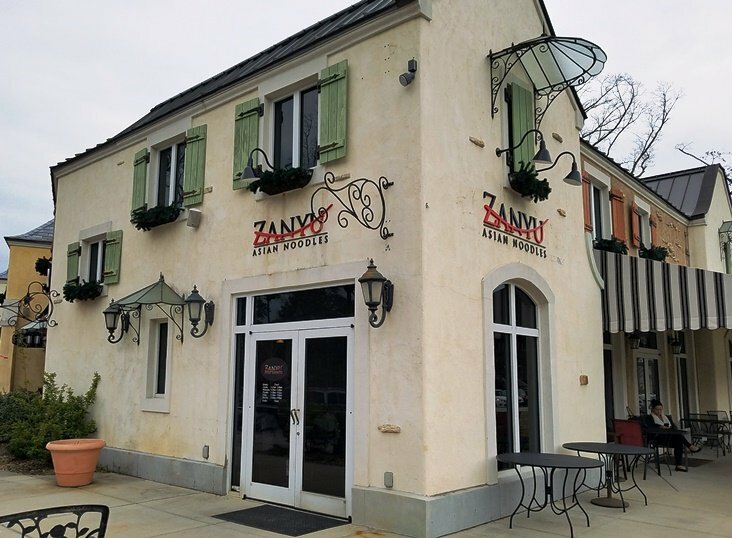 Head on over to Lafayette Village and in a corner location that used to house JoCa’s Gourmet Dawgs you will find the new Zanyu Asian Noodles. The set-up here is pretty basic: counter order with table service. Given the long, narrow shape of the restaurant, seating is limited (around 24 seats) although in warmer weather you can spill out onto a patio. 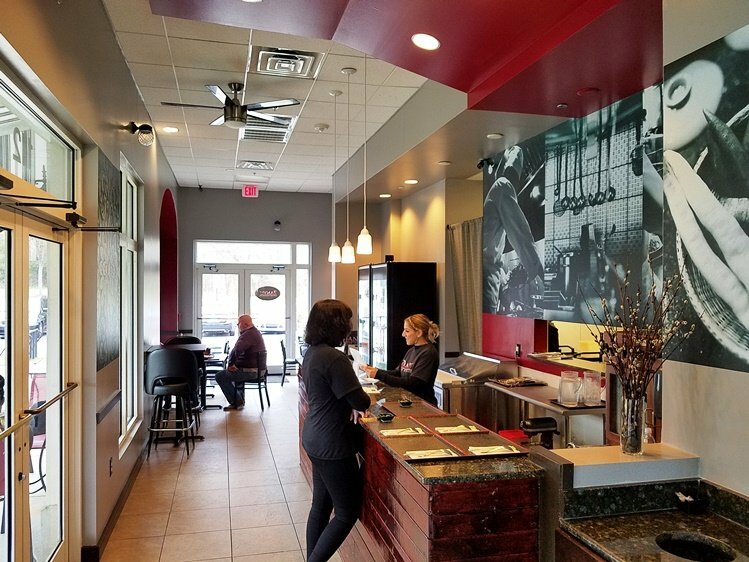 Decor is modern with hints of red along with large format black & white photography of past kitchens that chef-owner Michael Bongiorno has worked in. While the space is oddly shaped, it works fine for the quick-casual service that Zanyu Noodles is aiming for. Order at the counter (thankfully the menu is small: 4 appetizers, 10 noodle bowls) and your food will be brought out to your table. Over the course of a couple of visits, I was able to sample a good selection off of Zanyu Asian Noodle’s menu. 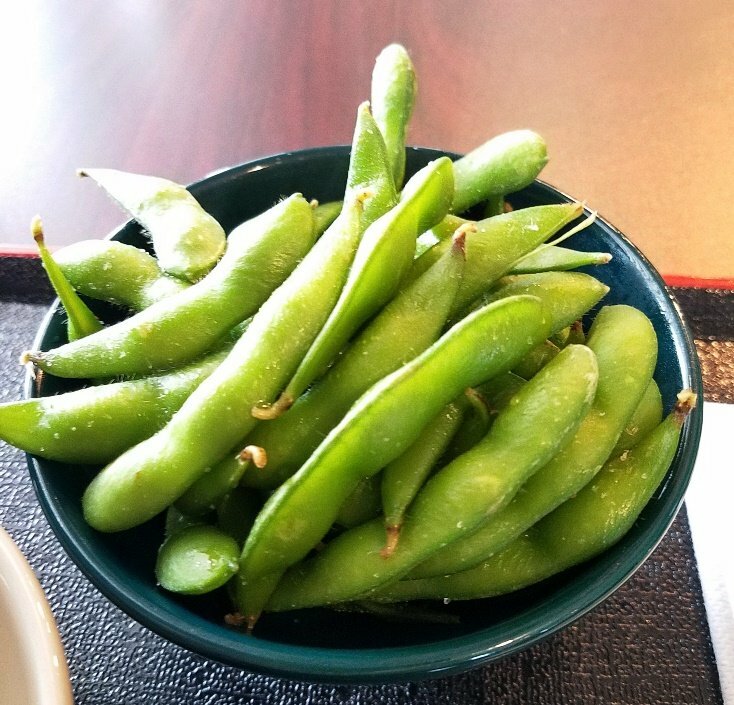 First up was a nice bowl of steamed edamame, plump soybean pods lightly sprinkled with yuzu salt. A super simple starter but very well prepared at Zanyu Asian Noodles. It’s important for a restaurant to pay attention to the small details and Zanyu Asian Noodles executes well on this simple appetizer. My main, the dry wanton noodles was extremely satisfying! A colorful bowl of tender noodles topped with perfectly fried wantons and thick, juicy pork slices. The noodles are not really dry but served with just enough of a soy sauce broth to keep it covered. 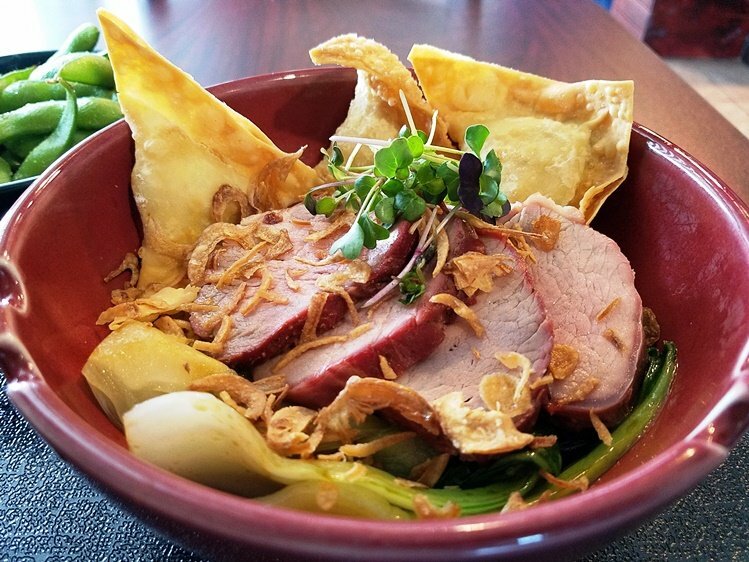 Given how flavorful the broth is for these noodles, I enjoyed how simple the preparation was for the pork and wantons. And the mix of baby bok choy and fried shallots on top just completed a wonderful meal. It’s a wonderful melange of textures and tastes for your chopsticks ranging from savory pinks, chewy greens and crunchy yellows! 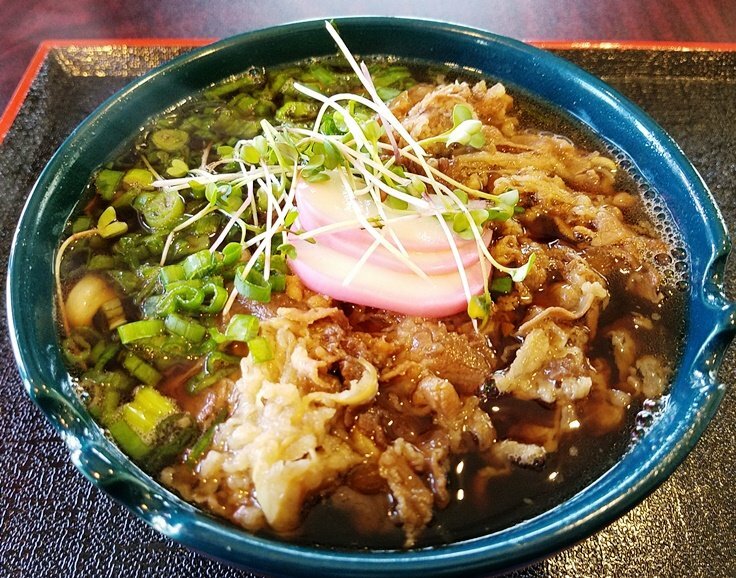 So wow, I really enjoyed my two visits to Zanyu Asian Noodles. While the seating isn’t ideal, the noodles and food here are outstanding. Given the quick casual service I can say that it certainly accomplishes its goal of getting you in and out fairly fast, similar to what you might find at a gourmet food stall in SE Asia. And I guess it fits what Chef Michael is probably shooting for: a modern rendition of a casual noodle spot similar to Noodle Blvd out in Cary. 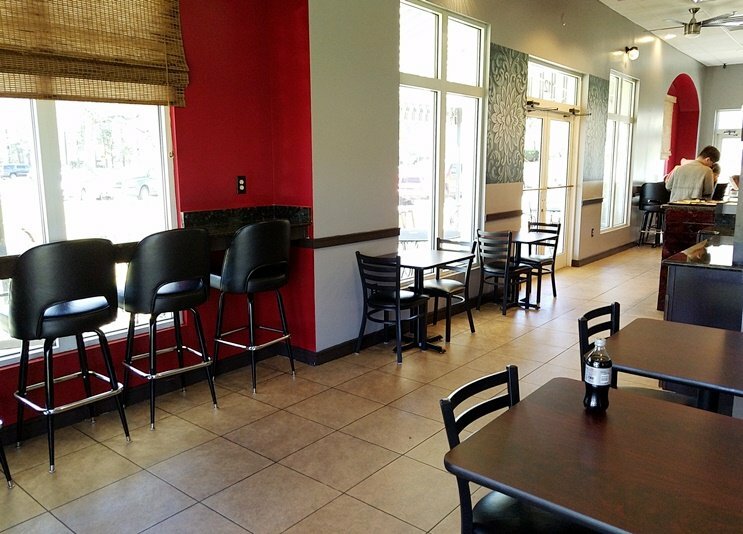 So don’t be put off by the casual set-up here at Zanyu Asian Noodles. The simplicity of Zanyu Asian Noodles belies the talent in the kitchen serving up some amazingly slurpable noodles, just go, eat and enjoy!